A long day of hiking! Explorers run a mixture of trips including day-trips, weekend trips, and afternoon walks. Our programme contains trips walks of varying difficulty, from easy ones with plenty of time to visit pubs, cafes etc, through to harder walks which cover a longer distance or gain more height. On trips to mountainous regions, some experience may be required for the more difficult walks, but we will make this clear at the time. You can sign up for our trips either by emailing the appropriate committee member, as specified in the week's publicity email or by popping into one of our Tuesday lunchtime meetings at the White Harte. With minibus trips we do require that you pay for trips before you're officially signed up, and please not that if you plan to drop out of a trip we can only give a refund if you cancel the Tuesday before the trip, or if we manage to fill your place. On the rare occasions when we have to cancel a trip, we will of course give a full refund. Please remember that when on a walk you are responsible for your own well being, we in general ask that you turn up reasonably well equipped. Make sure you bring along decent boots (not doc martins! ), decent trousers (not jeans! ), a packed lunch (with all important emergency biscuits), waterproofs if it looks wet, and a hat and gloves for wintery or colder mountainous walks. For more information see our equipment page. We will normally do a quick equipment check before our more challenging walks, if you haven't got the appropriate equipment you may not be able to do some of the walks on offer. The majority of trips that we offer are day trips, whereby we leave and return on the same day, taking either a minibus or public transport. These trips run on either a Saturday or a Sunday. For public transport walks, the only cost is the ticket fair; we try to go to places you can get to for £10 but sadly public transport costs are ever increasing just like everything else. We take the train a lot, so it's highly recommended that you get a young person's railcard which will get you a third of all fairs and can really make a difference if you plan on coming on even just a few walks. When we take a minibus we charge £10 to cover our expenses, including minibus hire, fuel and equipment. We typically meet for public transport walks at either Temple Meads or the Bus Station, and will specify the time and place in the weekly publicity email. For minibus walks we pick up either outside the main entrance to Merchant Venturers Building on Woodland Road at 8:15, or Churchill Hall at 8:30, please let us know where you'd like to be picked up from when you sign up. Links to maps of these places can be found at the bottom of the page if you're not sure. We ask that you arrive at the meeting point a few minutes before the scheduled leave time so that we are able to get away on time and make the maximum use of our day, and of course to make sure we don't miss the train! A couple of times a term we go away further afield and stay out for the entire weekend. This is always a lot of fun as it gives us a chance to explore some of the nicer places that aren't quite on our doorstep, in a more in-depth fashion. For these trips we take the minibus out on the Friday evening and head to the bunkhouse, go for a (typically) long walk on the Saturday, return to the bunkhouse for food, and head out on another walk on the Sunday before returning home via a chip shop. We tend to stay in bunkhouses for weekend trips, so you'll generally need to bring a sleeping bag, but you don't need to bring a tent or crockery. We have a few sleeping bags we can hire out if you don't have one of your own. You can leave all your stuff in the bunkhouse through the day, so you'll just need your day sack during walks, as well as the usual hiking gear. You'll of course need a change of clothes, shower stuff, and of course, don't forget your toothbrush! We supply you with a packed lunch and breakfast for both days and dinner on the Saturday evening (veggie friendly!). You will need to provide food for Friday evening, and have money for Fish & Chips or a takeaway on the Sunday evening. Although we pride ourselves in the amount of work we put into the club, on weekends we rely on volunteers to help us out; you are not on a package tour! Please help us to tidy up, prepare meals, etc. Pick-up for weekend trips is usually 17:30 on Friday evening outside Merchant Venturers Building, or 17:45 in Churchill Hall car park, maps are once again at the bottom of the page. 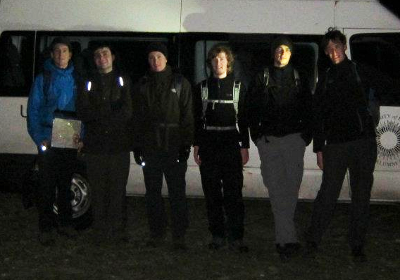 We charge £50 for weekends away, which covers minibus hire, fuel, accommodation, and most of your food for the trip. We will occasionally run walks on a weekday, typically leaving just after lunch on a Wednesday taking the afternoon to explore the landscape in and around the Bristol area. This often can take the form of evening walks and the occasional walk related social such as a treasure hunt. Sadly these walks are often very demanding on the committee who can be busy during the week, so we can only run them when demand seems strong, often only at the beginning of the academic year. Once a year we also go away for over a week to somewhere considerably more distant than our standard walks, typically abroad. The nature and cost of this trip changes from year to year, with precise details announced just before the club's AGM. The typical format is a camping trip (the club has tents and sleeping bags which can be borrowed if need be) with daily hikes and the potential for longer hikes featuring mountain huts or their equivalent. Recent trips have included Slovakia, the Pyrenees, Slovenia, the Alps and Scotland.